1 - How can my patients try a U-Step 2? We encourage you to have your patients, or their representatives call our toll free number so our customer service representatives can answer any questions they might have on the product or Medicare/insurance coverage. The easiest way for your patients to try a U-Step 2, is to have them call us at 800-558-7837 and order it. We have a fully refundable two-week trial. This will allow them to try it out in their own home or a rehabilitation center. If for any reason they are unsatisfied with the product, they can return it for a full re-fund. We even refund the initial shipping charge but not the return shipping. In some cases we can direct patients to medical centers that have samples where they can try it. 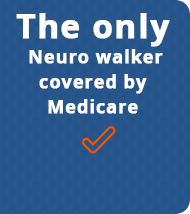 The U-Step 2 is the only neurological walker covered by Medicare. For example, it is covered for Parkinson’s disease, Multiple Sclerosis, and Stroke, to name a few of the more common conditions, where a person would use the U-Step 2. Medicare also covers if for people who have limited use of one hand and need one-handed brake controls. The U-Step 2 Medicare code (HCPCS) is E0147. As a national Medicare provider, In-Step Mobility, can submit claims on your patient’s behalf. Medicare reimburses up to $400. Any Medicare provider can also order in and submit claims for your patients. The U-Step 2 is reimbursable under Medicare Part B, which is only for home. Patient’s in the hospital or skill care facility, would not be eligible under their Part B benefits. Prior equipment, such as the purchase of walkers, wheelchairs or scooters, could disqualify them from Medicare coverage. In cases where a customer would not be eligible, In-Step offers discounts. In-Step also works with foundations, which often cover the cost when it is an issue. Many insurance plans and Medicare replacement plans often cover some or all the cost of the U-Step. In some cases a patient will need to purchase the U-Step 2 through a preferred distributor to obtain coverage. Our office staff can help you in determining your insurance coverage on the U-Step 2. Checking Medicare/insurance eligibility By faxing In-Step at 847-676-1202 with the pertinent patient information and a prescription, we can check into your patient’s eligibility and coverage for the U-Step 2 and get back to you or your patient with this information. By requesting remote In-service video conferencing, In-Step will provide you with product demonstrations at your convenience. To schedule a demonstration, please e-mail jmiller@ustep.com and request an in-service. Please e-mail your literature requests to walkers@ustep.com, please specify which products and how many brochures you would like if each product.